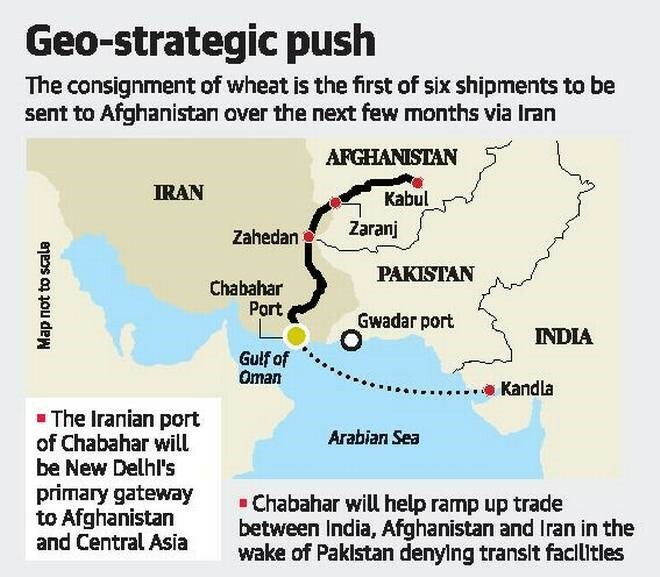 In a significant sign of trilateral cooperation, the first consignment of wheat from India to Afghanistan, via the Iranian port of Chabahar thereby bypassing Pakistan. The new route follows an ship-train route corridor in India and Afghanistan since 2016. This will be to let afghan products reach India. 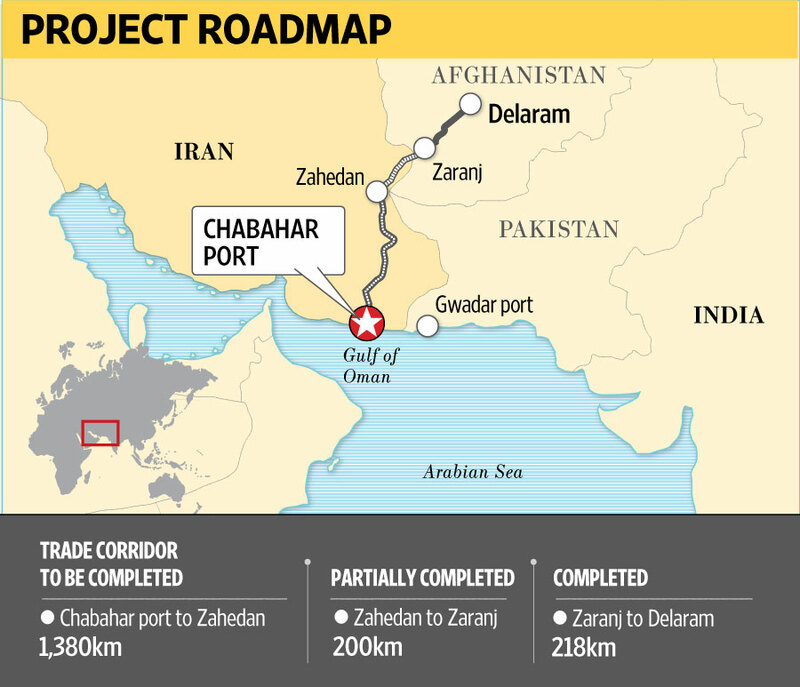 The plan is to connect Chabahar by rail to Zahedan in Iran to Zaranj in Afghanistan and there onwards into Delaram which is also in Afghanistan. If Afghan goods come up to Zahedan, they can be transported by a 1,380-km rail link to Chabahar and shipped to India. The Chabahar port, located in the Sistan-Balochistan province on the energy-rich Persian Gulf nations southern coast, lies outside the Persian Gulf and can be easily accessed from India’s western coast, bypassing Pakistan. In 2002, the idea of connectivity to Afghanistan was conceived via Iran and through chabhahar. It was after Taliban was defeated in 2002. The vital component was construction by India of Zaranj’s Delaram road. The strategic significance is that Pakistan will be a constant blockage to reach Afghanistan via its land and yet India manages to bypass it to achieve the larger security and regional stability goal. It is a signal to china, Pakistan and Afghanistan that it will overcome all barriers when it comes to developing ties with Afghanistan. The move is also significant as it indicates India remains firm in delivering on its regional commitment through partnership with Iran, despite Iran’s ongoing tension with the United States. Additionally, now India is looked by US as an alternative to its support to itself in Afghanistan and stabilize the situation there. Trump is looking at West Asia and Iran through Israeli prism where is if finding flaws with Iran. The world knows what Iran is to the development of the region. India has been dealing with Iran for decades. In past, before nuclear deal, there was huge pressure on India but it continued trading with Iran. Despite sanctions on Iran, India looks forward to widen its economic interests with Iran with oil, gas and trade and other sectors which have suffered since few years. Iran is critical for India’s access to Afghanistan and central Asia. Pakistan army’s world-view is that it wont allow access via Punjab-wagah into Afghanistan. But denial of this access is harming Pakistan. If CPEC has to reach its full advantage then access will have to be given. But the geopolitical scene will change as India has access to Afghanistan and India is demonstrating its ability to state and pursue its objectives whatever be the obstacles. This is the new India which shows a greater commitment. Once that happens, the international community takes note of it and the geopolitics change. Japan, Australia, Iran- trying to have alternative to OBOR of china. There is another collaboration of Russia, Pakistan, china and Iran. Russia also wants a stable Afghanistan because of economic interest- Chinese are looking for trade in their natural resources like minerals which are yet to be explored. The strategic interests are they fear Uighurs being trained in Xinjiang province, Kashgar Urumqi and sent across border create trouble. China and Pakistan were never happy of the Chabahar port development considering its nearness to Gwadar. However, it shouldn’t be overstated. China at this juncture has a great stake in stabilizing Afghanistan because as it is rising, it is realizing the problem of turbulence, instability in the region. A healthy competition will encourage more adherence to stability for shared prosperity of the countries in the region. India has made it clear that it has an independent foreign policy with regards to North Korea, Iran. These are the things that are going to lead to stability and prosperity for entire region. Long-term viability of the project has to be seen when it comes to India Afghanistan project. Baluchistan has to be stable. These goods have to now go to central Asia too as a next step. Chabahar has to emerge as a transit port and give competition to Dubai where currently the bulk cargo is getting disembarked and then being distributed from there. This role has to be now taken up by Chabahar in near future and India has to cooperate and support in building capabilities for the same. India, Afghanistan and Iran can tackle terror together. India has sent out a signal that Pakistan cannot destabilize the region and there is going to be prosperity. It will be shut out of the development in the region. It feels that if India gets into Afghanistan, then it will have greater leverage in its internal affairs an will lose its chance to spread terror. A new partnership is being forged between India-Afghanistan-Iran to stabilize as well as develop region. Discuss your opinion on the same. 1. What are cratons? How do they differ from shields? Discuss the distribution of major shields of the world. Also comment on their geological significance.